Wisconsin Gov. Scott Walker speaks at the Iowa Faith & Freedom Coalition 15th Annual Family Banquet and Presidential Forum held at the Iowa State fairgrounds on Saturday in Des Moines, Iowa. Walker dropped out of the race on Monday. We liked Rubio and Walker for pretty much the same reason: They seemed to have the best claims in the field for balancing conservatism with electability, historically a sweet spot for Republican nominees. Rubio’s policy positions are close to the mean of Republican elected officials — which is to say, they’re quite conservative without being “extreme.” But Rubio’s also a disciplined politician and potentially has the charisma to connect with a broader group of voters (hailing from a swing state like Florida and being Latino doesn’t hurt his electability case, either). Walker is slightly more conservative than Rubio — perhaps slightly “too” conservative for a general election candidate.2 But he had a genuinely impressive electability record in his favor, having been elected three times in four years (including a recall election) in a blue-leaning swing state, Wisconsin. Put another way, it looked like Walker could potentially be the best of both worlds for Republicans — bridging the gap between the establishment and the insurgent wings of the party by being a credible nominee with both groups. But any time a new product is billed as the best of all possible worlds, it could wind up being the worst of all possible worlds instead. A certain type of tablet computer might be advertised as a perfect substitute for both a laptop and a smartphone, for example. But it could turn out to be worse than a laptop at laptop things and worse than a smartphone at smartphone things, leaving pretty much no one satisfied. Likewise, Walker seemed to be nobody’s first choice — to the point that he polled at an asterisk (less than 1 percent of the vote) in CNN’s most recent poll after the second Republican debate. Voters craving a political outsider had shinier objects to chase down — most notably, Donald Trump. But Walker wasn’t doing all that well with the establishment either, having received just one endorsement from Republican governors or members of Congress since April, having (reportedly) had trouble balancing his campaign’s budget, and having developed a reputation for being gaffe-prone on the campaign trail. And yet, Walker still had a couple of things going for him. He had been polling well in Iowa for much of the campaign and was still a plausible winner there. And his favorability ratings — sometimes a better indicator of who could be a broadly acceptable nominee — were reasonably good among Republican voters, at an average of about 45 percent favorable and 20 percent unfavorable in the most recent polls. 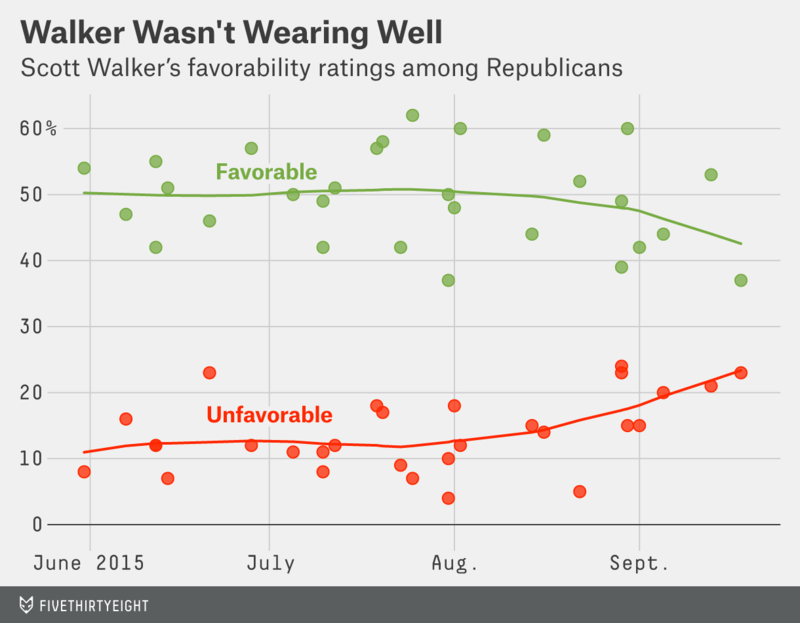 One problem for Walker is that those favorability ratings had been falling, slightly. But more strikingly, he was having trouble making much of an impression at all with voters. In June, his combined favorable and unfavorable rating among Republicans was 60 percent. As of now, it’s only about 65 percent. Walker’s name recognition — or at least, the number of voters who know him enough to have an opinion about him — hasn’t increased very much at all. Many people will compare Walker to Tim Pawlenty, who similarly had trouble differentiating himself from the field (in 2011, I described Pawlenty as the RC Cola of candidates). The comparison mostly works, though with a few qualifications. On the one hand, Walker began the race with a higher national profile than Pawlenty — and a signature political accomplishment in having fought public-sector unions in Wisconsin and then winning a recall election contested on that issue. On the other hand, there’s even more of a premium on differentiation in a 17-candidate field than in the one Pawlenty faced four years ago. But for all the inevitable second-guessing about Walker’s campaign — and to their credit, some observers including Alec MacGillis have been questioning Walker’s political acumen to begin with — it’s also possible that he got unlucky in some senses. 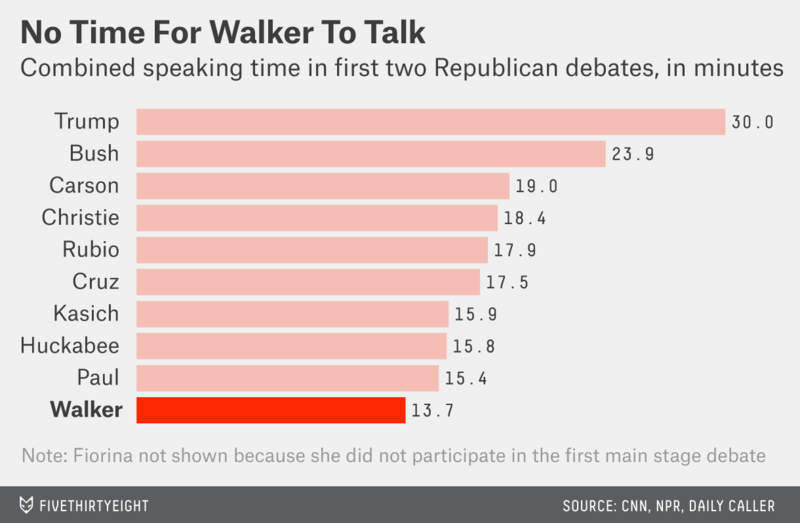 Walker was mediocre in the debates, but he had fewer than 14 minutes in both debates combined to speak to voters: the least for any candidate on the main stage for both events. And while Walker had some missteps on the campaign trail — such as implying that the U.S. should consider building a border wall with Canada — they don’t seem to be much worse than the gaffes other candidates have committed. 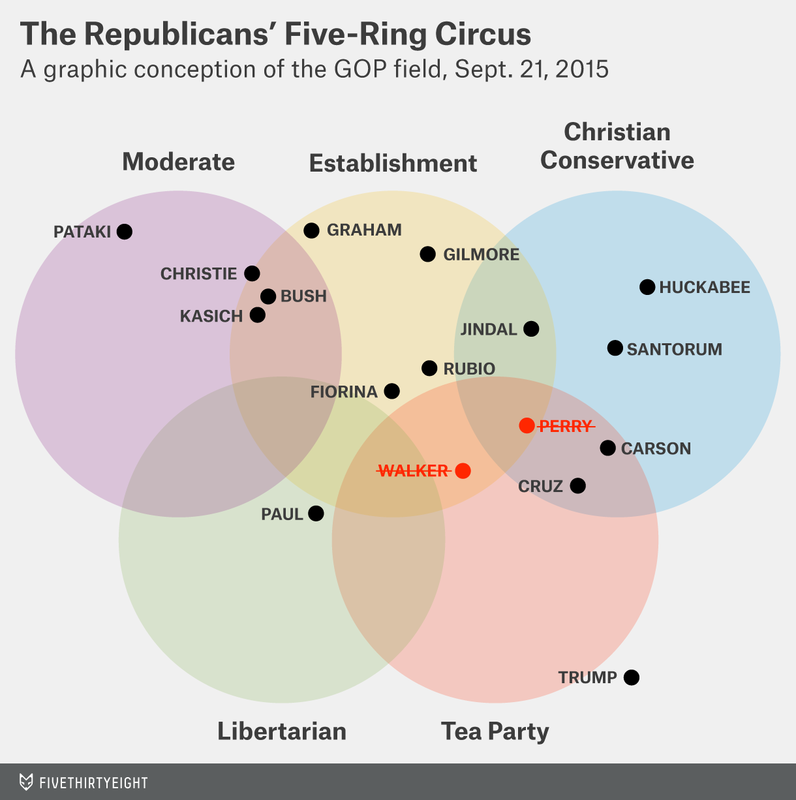 But Walker was caught in something of the same vicious cycle as Hillary Clinton. There were some genuine but not obviously mission-critical problems with his campaign; there were some poor polling numbers; and there was increasingly negative media coverage. All of these tended to feed back upon and accentuate one another, making his situation worse. Unlike Clinton, however, who (probably) has the resources to pull herself out of the spiral — and who benefits from the lack of competition on the Democratic side — Walker won’t get a second chance to make a first impression. Check out all of our 2016 election coverage. Technically, Walker “suspended” his campaign. There’s evidence that candidates with very liberal or very conservative policy positions slightly underperform in the general election.